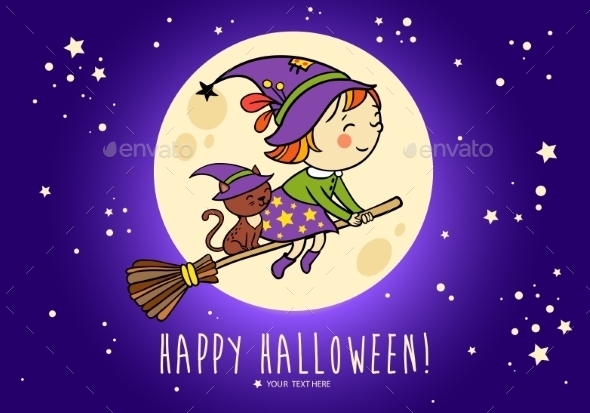 Halloween vector card with funny witch and her cat on a broomstick flying in front of the moon . Bright holiday background in vector. Vector Invitation Card with Insects. ; Seamless Vector Illustration with of Strawberries; Pattern with a Strawberry Plant; Anthill and Ants; Ant That Bears; Butterfly; Green Grasshopper. Keywords: autumn, black, broom, broomstick, cat, celebrate, celebration, children, dark, design, fall, fly, fun, girl, halloween, hat, holiday, illustration, light, magic, moon, night, october, season, star, text, vector, violet, witch, woman.